Earlier this summer, I made something with grilled sticky rice. It was good, but not perfect. I came across a picture of a rice burger and did some research. I've got a huge bag of sticky rice (also called glutenous, but fear not - there is no gluten! The rice just acts like it has gluten because it's so sticky) that I want to make a dent in. I found this recipe for chicken burgers, which were DELICIOUS. The rice 'buns' are rice patties that are pan fried on both sides so they are crispy on the outside and sticky and soft in the inside. If you eat them while still crispy and warm, they will hold up to being eaten like a sandwich. If they cool a bit and soften up a little it's harder to eat, so I've seen people wrap their sandwiches in plastic wrap or wax paper. I made mine with a teriyaki sauce and some mushrooms and onions. It was phenomenal. In the food processor, grind the chicken. Add the other ingredients and pulse until it's a fairly smooth paste. Drop by large tablespoons into a hot pan with 1 T oil, and flatten slightly. Cook for a few minutes on each side. In a small saucepan, combine the soy sauce, mirin, chili flakes, cup of water, and sugar. Heat until sugar is dissolved. In a small bowl, combine the remaining water and cornstarch. Stir into mixture on the stove, and bring to a light boil until thickened enough. Remove from heat, and let cool. Soak the rice for at least a few hours ahead of time, or overnight if you want. drain the rice, and put in a bowl with the water. It should cover the rice by about a half an inch, if not add a little more. Cover the bowl with a plate, and microwave 3 minutes. Stir, return to microwave, and keep microwaving on 3 minute intervals until rice is cooked. It takes 12 minutes in my microwave. Sticky rice should be cooked in a bamboo steamer, apparently, but cooking in the microwave is simple and easy and fast. Let the rice cool. Once cooled, form into patties with wet hands. You will need to rewet your hands a few times to wash off the sticky starch the rice leaves on your hands. Heat oil in a pan over medium heat, and cook the patties about 5 minutes on each side, more if you want it crispier. I press down on them with a spatula while they're cooking to flatten them more, so I can fit my sandwich into my mouth. Flip, and repeat. Heat the oils together in a pan. Cook the onions for a few minutes until softened, then add mushrooms and salt. Cook until mushrooms begin to soften, add mirin, stir, and cook until mushrooms turn golden brown. Place one sticky rice bun on a plate. 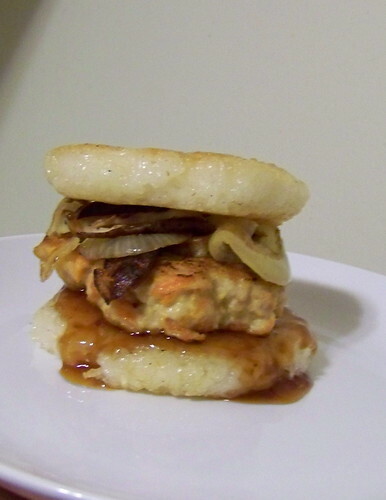 Spread with teriyaki sauce, then place a chicken burger on top. Top with mushrooms and onions, spread another rice bun with sauce, and top the sandwich. Eat, repeat. YUM.... that looks SO GOOD. Did the "rice bun" actually stay together? That's a good idea... I guess you could eat it with a fork if its' falling apart. Your cheese rolls also look awesome, just printed your recipe to try at home! 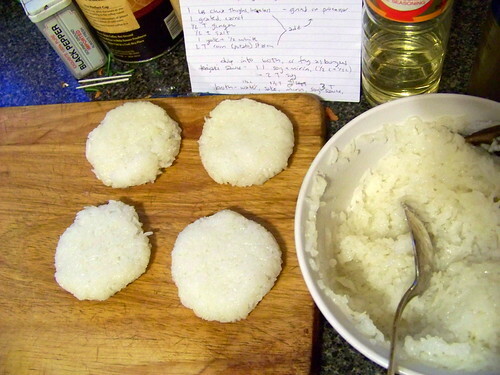 Rice 'buns' totally stick together, provided you use sticky rice and pan fry them to get a crispy layer on the outside. And they're soo good. I wish I didn't have a fridge full of leftovers so I could make something with them tonight! Let me know how the cheese rolls turn out! I just started making these, though I've heard about them for a couple years now. I love them! I'm completely hooked and am coming up with other ideas for them (which I hope to post in my blog as I work on them). Here's a suggestion. Add a little bit of mayonaise, egg whites and wasabi (optional). The mayo adds a little richness, but if you add egg whites while the rice is cold it will help bond the rice together when you cook it. There's no need to mash the rice together, otherwise you'd get a big ball of mush. You can add shallots for added flavor.